This article is about the amiibo-based board in Mario Party 10. For Yoshi's board in the original Mario Party, see Yoshi's Tropical Island. The Yoshi Board is a board that appears in Mario Party 10. It is available exclusively in the amiibo Party mode, where it can be played on when the Yoshi amiibo figure is scanned on the . Like all other amiibo boards, the Yoshi Board is based around a certain character, who in this case is Yoshi. The board takes inspiration from the Yoshi franchise, featuring many elements from that series. These include Shy Guys, Yoshi Eggs, fruit, and objects made out of crafting materials such as wool and cardboard. The board's highlighted feature is a giant Yoshi Egg. If someone were to stop by, they can deposit a Special Dice Block (one will be given if the player has none) and get two back. 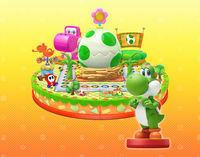 Three giant Yoshi figures can also be seen on the board, which can be used to steal Special Dice Blocks. This board's music comes from Yoshi's Story. When passing through the area in the top-left corner, the player gets a random chance to clone one of their special Dice Blocks or turn it into a Star. If the player doesn't have any special Dice Blocks, then they can simply obtain a new one, just like on a Special Dice Block Space. After landing on the Event Space, the player gets a chance to steal a random Dice Block from an opponent chosen by the player. An image from the Japanese website depicting the giant Yoshi Egg. This page was last edited on August 1, 2018, at 10:01.